Calnan Flack have successfully managed bespoke Share Portfolios for Investors since our inception in 2013. In 2017 Calnan Flack were appointed as an Investment Manager on the Powerwrap Investment Platform. 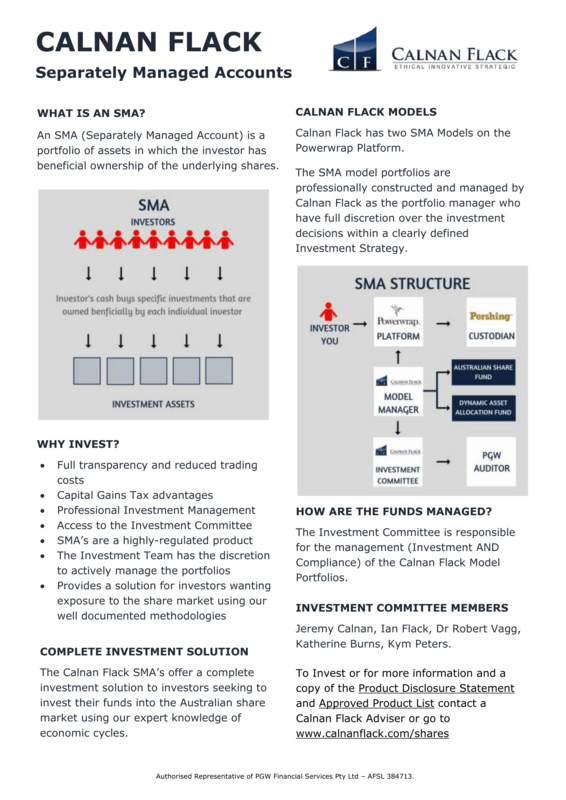 We now manage two Separately Managed Accounts (SMA’s) which provides investors wanting exposure to the share market using our well documented methodologies an efficient and professionally managed solution. 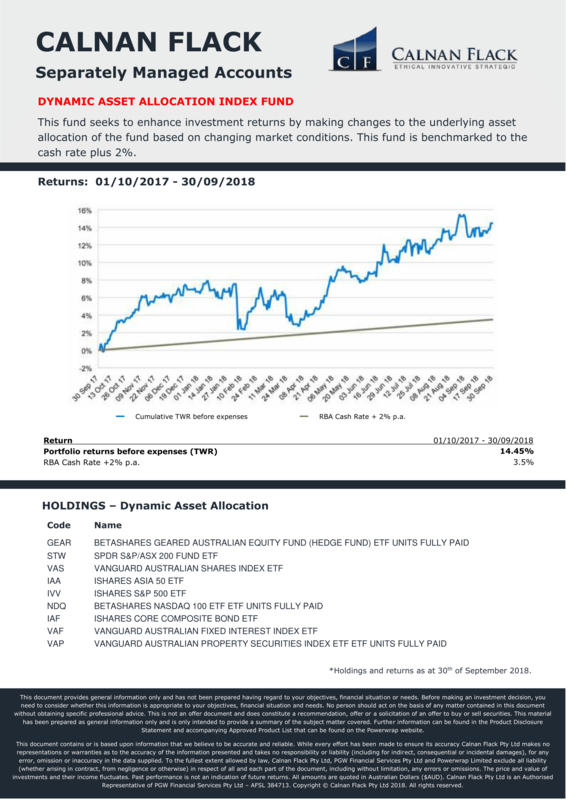 The Calnan Flack SMA’s offer a complete investment solution to investors seeking to invest their funds into the Australian share market using our expert knowledge of economic cycles. If you would like to further discuss how our SMA’s can help you achieve your financial goals or to answer any questions you may have, please register your interest and we will be in touch. An SMA (Separately Managed Account) is a portfolio of assets in which the investor, has beneficial ownership of the underlying shares. 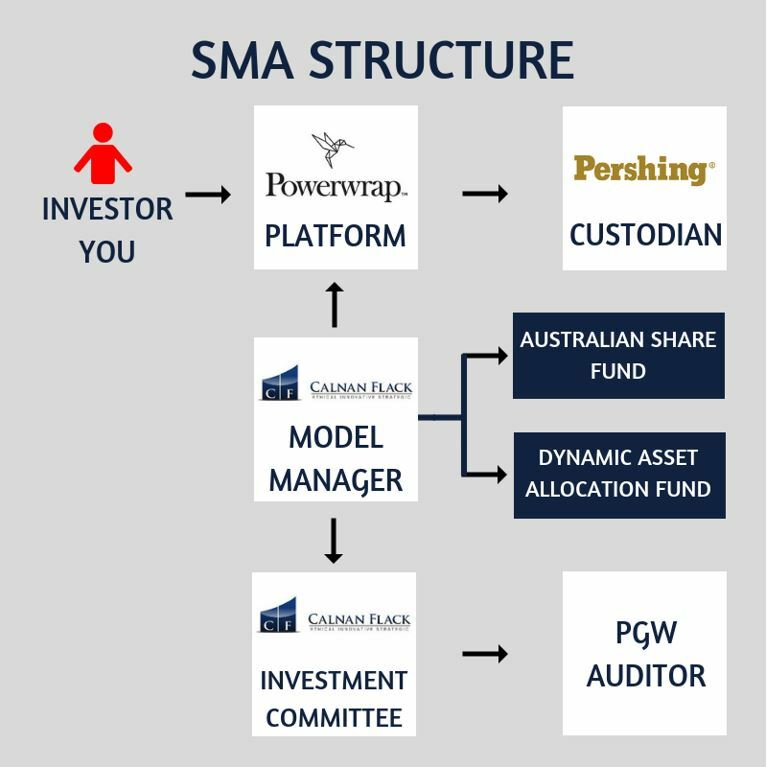 The SMA model portfolios are professionally constructed and managed by Calnan Flack as the portfolio manager who has full discretion over the investment decisions within a clearly defined Investment Strategy. Calnan Flack has two SMA Models. These can only be accessed on the Powerwrap Platform. 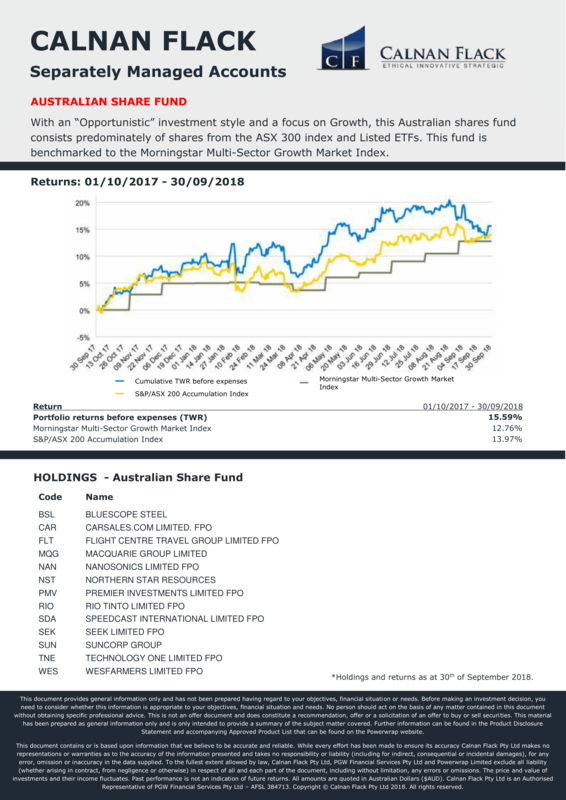 With an “Opportunistic” investment style and a focus on Growth, this Australian shares fund consists predominately of shares from the ASX 300 index and Listed ETFs. Where the manager seeks to enhance investment returns by making changes to the underlying asset allocation of the fund based on changing market conditions. Professional Model Managers will invest the portfolio to a defined investment mandate. Jeremy Calnan, Ian Flack, Robert Vagg, Katherine Burns & Kym Peters. This recording of Dr Robert Vagg is taken from the May 2017 Forecasting Weekend held in Sydney. In it he further explains how the Dynamic Asset Allocation Model works.